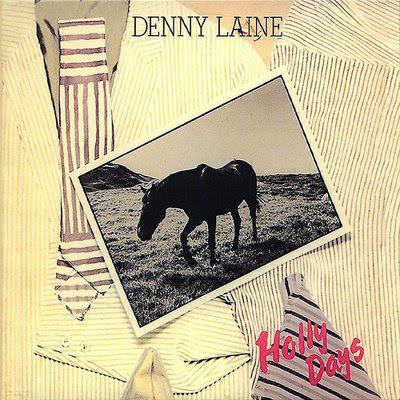 Denny Laine (born Brian Frederick Arthur Hines, 29 October 1944, Tyseley, Birmingham) is an English songwriter and multi-instrumentalist, best known for his roles as former guitarist and lead singer of The Moody Blues and, later, co-founder (with Paul McCartney) of Wings. Denny Laine is of Romani descent, was educated at Yardley Grammar School in Birmingham, and took up the guitar as a boy under the influence of jazz legend Django Reinhardt; he had his first solo performance as a musician at the age of twelve and began his career as a professional musician fronting Denny & The Diplomats, which also included future The Move and Electric Light Orchestra drummer Bev Bevan. In 1964, Laine left The Diplomats to join Mike Pinder in The Moody Blues and sang their first big hit, "Go Now"; other early highlights included "From The Bottom Of My Heart", "Can't Nobody Love You" and the harmonica-ripping "Bye Bye Bird". However, Denny's tenure with the MB's was short-lived and, after a number of comparative failures, Laine quit the band in late 1966(the last record issued by The Moody Blues that featured Laine was "Life's Not Life"/"He Can Win" in 1967, but "Boulevard De La Madelaine" looked ahead to the fancier sounds that the MB's would later become famous for). After leaving The Moody Blues, he formed The Electric String Band, which featured Denny (guitar, vocals), Trevor Burton (guitar, another former member of The Move) and Viv Prince (drums), also featuring electrified strings in a format not dissimilar to what Electric Light Orchestra would later attempt. They made two singles, "Say You Don't Mind / Ask The People" (Apr 1967, Deram) and "Too Much In Love / Catherine's Wheel" (Jan 1968, Deram); and, in June 1967, they shared a bill with The Jimi Hendrix Experience and Procol Harum at the Saville Theatre in London. However, national attention was not to be, and the pioneering Electric String Band broke up. (There was apparently a third single recorded called "Why Did You Come?". Why it never released is unknown, but there has been rumors that the finished track - and probably the B side as well - was sent by post to Decca and was lost.) Laine and Burton then went on to the band Balls from 1969 until the band's breakup in 1971, with both also taking time to play in Ginger Baker's Air Force in 1970. (Only one single was issued by Balls; "Fight For My Country" / "Janie, Slow Down" on UK Wizard Records. Strangely, the top side was re-edited and reissued on UK Wizard and issued in the US on Epic under the name of Trevor Burton, which was odd since Laine and Burton shared lead vocals on the B side. The single was reissued again as B.L.W. as "Live In The Mountains" for a small Pye distributed label. There was supposed to have been a Balls album recorded, but it has never seen the light of day). Laine's 1967 song "Say You Don't Mind" was a hit when recorded in 1972 by ex-Zombie, Colin Blunstone. In 1971, Denny joined Paul McCartney to found the group known as Wings, and would stay with them for a full ten years until they officially disbanded in 1981; Denny provided lead & rhythm guitars, backing vocals, keyboards, bass, writing and co-writing skills, as well as being a solid solo performer. Together with Paul and his wife, the late Linda, they formed the nucleus of the band, being called that "strange, 3-winged beast". It was with Wings that Denny enjoyed the biggest commercial and critical successes of his career, including co-writing the smash hit "Mull of Kintyre". In January 1980, McCartney was arrested upon arrival for possession of marijuana at an airport for a tour in Japan. The tour was cancelled and Wings unofficially had their wings clipped; they recorded through the year on new tracks as well as old tracks still in the vaults, but a press release by Paul in early 1981 officially announced that Wings had come in for a landing. The new tracks ended up on Paul's next two solo albums, and Laine's relationship with McCartney soured(speculation also has it that financial matters were close to the heart of this dissolution, similar to the McCartney/Jackson partnership). The title track of Denny's first solo album after Wings, called "Japanese Tears", appeared to be a visible attack on McCartney much like John Lennon's "How Do You Sleep?" in 1971; however, closer inspection to the lyrics shows that it more likely tells the tongue-in-cheek story of a japanese fan's disappointment after Wings' tour got cancelled(or possibly even tears of excitement at Wings' arrival in Japan in the first place). Denny filed for bankruptcy in the mid-80's after selling his lucrative co-publishing rights to "Mull of Kintyre" to co-author McCartney. However, he has continued to record music at a prolific rate and has appeared at Beatles conventions and on tributes to both The Beatles and Wings. He is currently working on an autobiography. He was briefly married to Jo Jo Laine (born 13 July 1953 — died 29 October 2006), with whom he had a son Laine, and a daughter, Heidi.